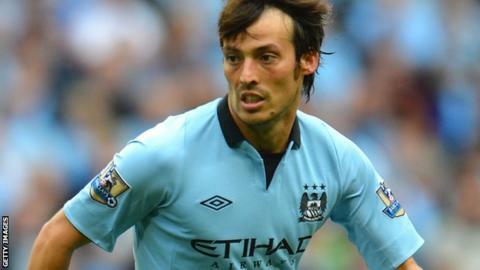 Manchester City playmaker David Silva has signed a new five-year deal that will keep him at the club until 2017. The 26-year-old joined from Valencia for £24m in 2010 and missed just two league games last season as City secured their first title since 1968. Club honours: Spanish Cup 2007/08, FA Cup 2010/11, Premier League 2011/12. The Spain international had been linked with a return to his home country but says he is more than happy in England. "I feel very happy here at the club, in the city and with all the people," he told the club's official website. "So now I'm delighted to be extending my contract and being here really does feel just like home for me." Silva helped City win the FA Cup in his first season in England and after last season's Premier League title, he is now targeting European success. City failed to progress beyond the group stages in their first Champions League campaign last season and face Real Madrid in their opening game of this year's competition in the Bernabeu on Tuesday. "The retention of David Silva on a new five-year contract stands alongside any of the important deals Manchester City manager Roberto Mancini will conclude. Silva has provided elegance, creation and world-class talent since his arrival from Valencia and was a key element of their Premier League title triumph last season. The Spaniard would have been a target for any elite club in Europe had there been any questions about his future and it is a sign of City's continued ambition that he has been convinced he should spend more of his peak years at The Etihad." Silva added: "We've won the Premier League title and two other trophies too, and the team is growing and we are now aiming at the Champions League and so that also is another reason to want to stay here and try and win it. "I feel very comfortable here and I want to try and win trophies like those. "These last two years have gone very well and so let's hope that the next five go as well or even better." As well as enjoying silverware with City, Silva has been an integral part of the Spain side that has become the first team to win three successive major tournaments. After starting his career with Celta Vigo, Silva made his name at Valencia before making his move to the Premier League. Despite playing with an ankle problem for much of last season, he created 15 Premier League goals - more than anyone else in the division - to help secure the title for Roberto Mancini's side.